A brilliant opportunity to support the national hockey team this summer. Ireland players celebrate in London last summer. WANT TO WATCH Ireland’s 2018 Hockey World Cup heroes on home soil as they set out on the road to Tokyo? Well, you’re in luck. Tickets for the FIH Hockey Series Finals tickets are now on sale, with Banbridge Hockey Club hosting the tournament from 8-16 June. 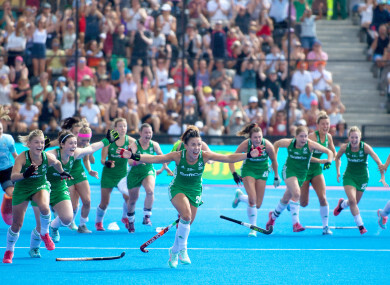 The International Hockey Federation [FIH] had originally awarded the hosting rights to Dublin, but Hockey Ireland were forced to switch-up due to a lack of a suitable venue in the capital. The tournament was originally planned to be staged in UCD but redevelopment work on the National Stadium was again delayed, while the option of using the new state-of-the-art pitch on the National Sports Campus in Abbststown was also explored, but to no avail. So all eyes are now on Banbridge for the start of the women’s national team’s bid to qualify for the 2020 Olympics. Ireland are still without a permanent head coach following the shock departure of Graham Shaw. Under the watchful eye of caretaker boss Arlene Boyles, they’ll be hoping to build on last year’s World Cup silver medal and qualify for the Olympics for the first time. The Green Army open their FIH Series Finals campaign against Malaysia on 8 June before facing Czech Republic and Singapore in further Group A games on 9 and 11 June. The eight-team tournament will be shown live on BT Sport. Tickets for the tournament can be bought here. Email “Tickets on sale as Ireland's World Cup heroes set for Tokyo 2020 qualifiers on home soil”. Feedback on “Tickets on sale as Ireland's World Cup heroes set for Tokyo 2020 qualifiers on home soil”.